I love it when girls appropriate men's style of dressing. Last year I went on a crazy search for men-styled oxford shoes but it was slim pickings out there for me (they are now everywhere of course). 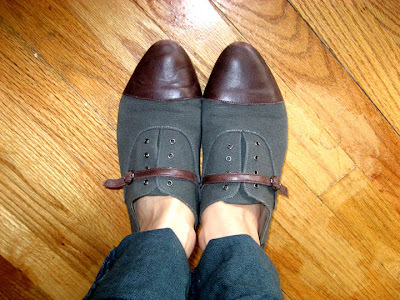 I did manage to score this sweet pair of "manshoes", though I admit that at first I thought they were a little too weird and sort of ugly but I think that's why I slowly fell in love with them. I couldn't stop thinking about them so after a couple months, I went back to the store and got them. But the real reason why I love them so much is because they remind me of the shoes worn by the dad from one of my favorite comic strips, Mafalda. I think I must live in a completely made up fantasy world when all I ever do is take style cues from Judy Funnie and Mafalda's dad (he didn't have a name). I LOVE the shoes. I covet the charcoal flannel/dark brown leather combo in all its forms. Great silhouette, too. The buckle adds something fun. Who made 'em? They are from Camper. shhh. don't tell anyone, they are my secret go-to store for awesome shoes.